Remember that time I tattooed myself? 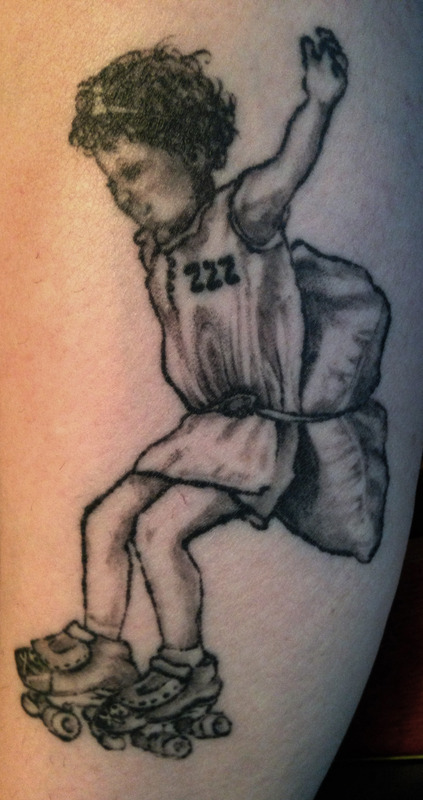 People have asked me about my leg tattoo, and I’m not TOO sad about how it turned out, so I’ll share. I made a couple of modifications to the original photo. First, I was initially hesitant to add my derby number, but it’s a number I associate with my husband, so I decided it was safe. He had always been so super supportive from the minute I joined. 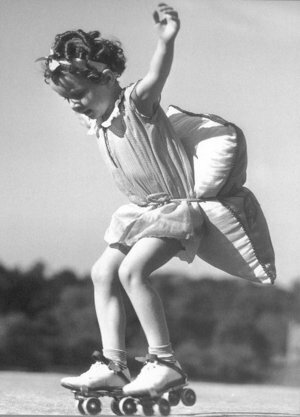 Second, the girl in the original pic had old-school strap-on-your-shoes roller skates. I traded them out for a portrait of my favorite pair of skates…Reidell Minx 965s with Sure-Grip Avenger 45 degree angled plates. I’m cheap when it comes to clothes, and I’m not one for designer bags, so this was a BIG purchase for me. But, lemme tell you, those boots were MADE for flat-footed folks like myself and they were HEAVENLY. And the Avenger plates were like skating on butter. I LOVE them. They were so sweet & sassy, I called them my “Darth Skaters.” My Caddilacs. I have leather toecaps on the ends with cute little red skulls, so I added those, too. As for the tattooing itself…..well, it could’ve been better. 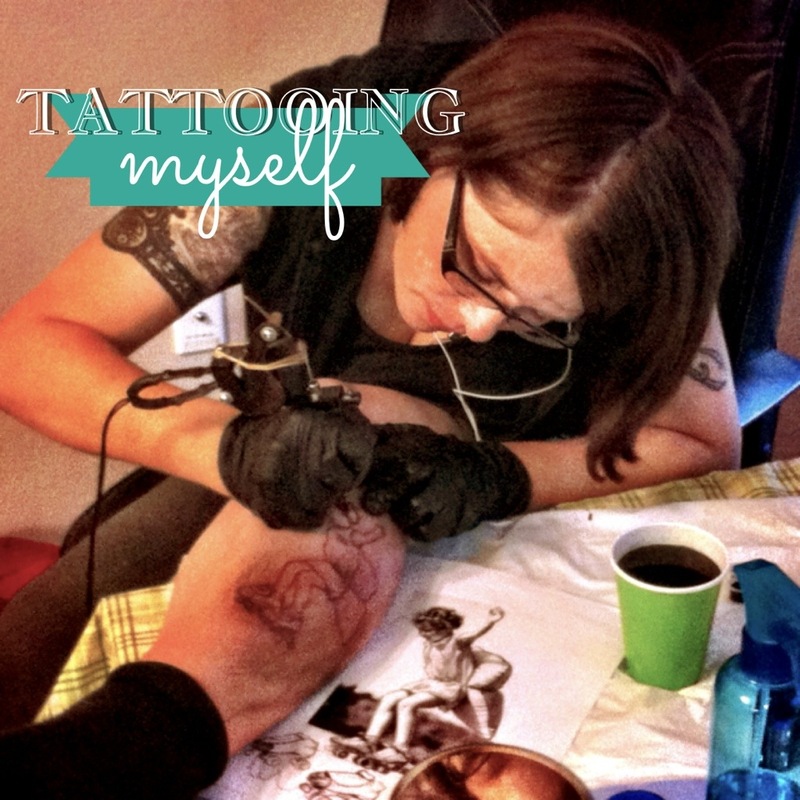 Tattoo artists have warned about tattooing yourself; you’ll be overly critical, you’ll obsess about it. As your work improves, you’ll regret your earlier work. But I thought if I was willing to tattoo on someone else, I should trust myself to tattoo myself. Turns out the tattoo artists are right, in a way. The lines were QUITE wobbly because I was SOOO nervous about how it would turn out. There is a technique for artists where you draw something from a reference upside down, so it loses its preconceived shapes and becomes just the shading & shapes that you need to translate to your work. I have never been good at this technique, and despite my practicing drawing it several times, I wasn’t crazy with how it turned out. The face, more specifically. Looking back now, it’s such a smaller tattoo that the details (or lack thereof) of the face don’t matter much, but I was REALLY down about it at first. I thought I had butchered it. All in all, though, I am pretty happy with the final piece! It means what I wanted it to mean, and I don’t think it turned out TOO bad for tattooing it upside down on my own leg. I LOVE it! Mica, you amaze me!!! I can’t believe you did that upside down! Thank you, Jelena! My heart was pounding the whole time. I love that you did this, even if it didn’t turn out exactly how you would’ve wanted it to. I’m a tattoo artist, mom, and painter as well. 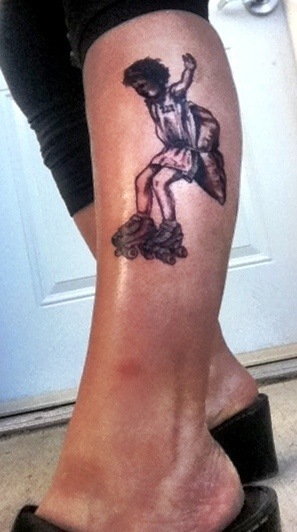 Finally, after tattooing other people for the last 5 years, I gave myself one a couple of nights ago – also on my leg. My ankle, actually. It’s a pretty complex henna pattern that I freehanded first, then tattooed over. And ya know, I’m more happy with the fact that I did it than I am even with the tattoo itself. I think you know what I mean, eh? What do you think of derby? I’ve considered doing it the last couple of years but am chicken – afraid of breaking a wrist or getting fingers rolled over.